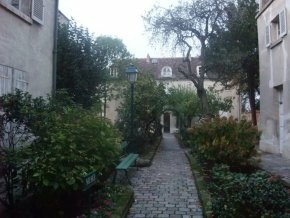 The Musée de Montmartre is managed by the Société du Vieux Montmartre which originated in 1886 and since 1960 is located in one of the oldest houses on the hill (ill. 1), dating from the 17th century, the former residence of Claude Delarose, known also as Rosimond, an actor and friend of Moliere who succeeded him in most of his roles. It was listed as a Musée de France in 2003. 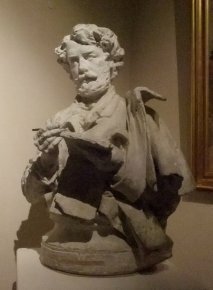 The collections are essentially historical but also include some important art works : a few paintings, one of which is by Maurice Utrillo and was acquired in 2008  (ill. 2), drawings (Steinlen, Léandre …), sculptures (including a Bust of Gavarni by Denis Puech – ill. 3), photographs, a collection of china pieces from the Clignancourt factory, several hundred original posters, etc. Most of these things entered the collections through donations or bequests. 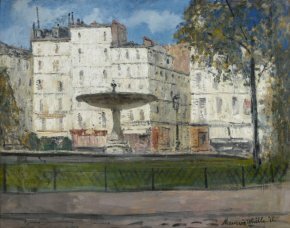 There are also deposits from museums (Parce Domine by Adolphe Willette) or private collectors (works by Suzanne Valadon…). The auditing report we discuss below states that although the collections “appear to be very heterogeneous in quality, [they] present an undeniable interest history of the Butte [Montmartre] and legitimize the existence of the museum”. The establishment finds itself in a precarious financial situation today thus resulting in an audit carried out jointly by the Inspection general des musées (DMF) and the Inspection general de la Ville de Paris. The report, published in December 2007, can be seen on the net here. It states clearly that the museum cannot continue its activity under the present conditions. In fact, it is constantly in deficit, and survives only due to the resources provided by the important bequest of Madame Moniot in 1990 . The city of Paris rents the building out to the museum and has granted it 124,000 euros in funding. After deducting the rent, this annual subsidy comes to 40,000 euros. There is a remaining deficit of 150,000 euros a year, which for the moment is paid by the Société’s own funds, that is mostly the Moniot bequest which, at this rate, will soon be depleted in a few years. The Société du Vieux Montmartre, as explained to us by Daniele Pourtaud, assistant to the mayor of Paris in charge of Cultural Affairs, made some management mistakes in the past which current administrators now admit. A curator, appointed in 2002, resigned in 2005 after clashing with the former president who had made some very debatable choices such as notably that of organizing an exhibition on Jean Marais last year, based on a private collection, and which turned out to be a huge financial handicap as it cost the association 200,000 euros. And yet the final proposals made by Paris city hall run in fact contrary to this wish. They request that the association be dissolved and provide for the fine arts collections to be turned over to the Musée Carnavalet, the historical documents to the Bibliotheque Historique de la Ville de Paris and the holdings on French songwriting to the Médiatheque musicale de Paris. This would sign a death sentence for the Musée de Montmartre. The solution of dispersing the collections is unacceptable not only in terms of national heritage, but also impossible to carry out legally as article L451-10 of the Code du patrimoine stipulates that “the assets of the collections in the Musées de France belonging to a non-profit private legal entity acquired through donation or bequest or with the help of the government or a local municipality can only be ceded, for free or at a price, to a public entity or to a non-profit private legal entity which have expressed their previous commitment to affect these assets to a Musée de France.” And yet, neither the BHVP, nor the Médiathèque musicale are listed as being a Musée de France. Furthermore, those who are familiar with the BHVP’s policy (see notably this article in French) can only tremble at the thought that the city of Paris wishes to entrust it with additonal collections. If the city thinks that it is impossible to maintain the management by an association, why does it not transform this establishment into a Musée de la Ville de Paris, a solution which would be acceptable to the Société du Vieux Montmartre ? The dissolution of the museum would be a tremendous blow to the French capital’s heritage. Moreover, the present condition of the museum, as well as that of the Hôtel Demarne, requires in any case considerable repairs. 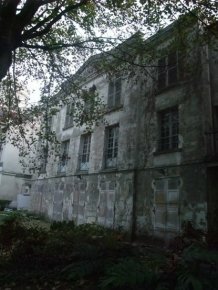 Although the previous management was poorly carried out by the association, the same can be said today of the city of Paris which has allowed the building to remain uninhabited for several years. Madame Pourtaud has complained that no cultural or scholarly project has been presented. This is only partially true. A draft exists, dated 16 November 2007, and which represents a solid basis for the project, notably by proposing that the exhibitions might take place in the Hôtel Demarne, thus allowing the permanent collections to stay in place instead of being moved into storage each time. This draft has not yet been validated as the museum, which does however include an art historian in charge of scholarly affairs, no longer has a curator. Thus the project cannot be completed and applied unless a solution is found, including appointing a curator. The re-opening of the Musée Jean-Jacques Henner as well as the very dynamic management of the Musée de la Vie Romantique are clear proof : small museums deserve to have a place next to large ones. The one in Montmartre is not only exquisitely charming, it also plays a very real cultural role in Paris. Visitor attendance has climbed steadily and today represents around 50,000 people a year, a significant number. It enables the exhibition of works, which if transferred to Carnavalet, would almost surely be relegated to storage. It also offers tourists and visitors the chance to discover a 17th century house (and perhaps tomorrow a private 18th century residence in the case of the Hôtel Demarne) in perfectly preserved surroundings, with a magnificent view of Paris. The Musée de Montmartre must be saved. A petition Laisserons-nous disparaître le musée de Montmartre has been posted here. Acquired on 9 April 2008, Hôtel des Ventes Artcurial, Paris. The use of this bequest to cover the deficit in the management is in fact debatable : although Madame Moniot had not specified its use, it was originally intended only for acquisitions.